A2 studding for use with resin anchor systems. Pack contains washers and hexagon nuts. 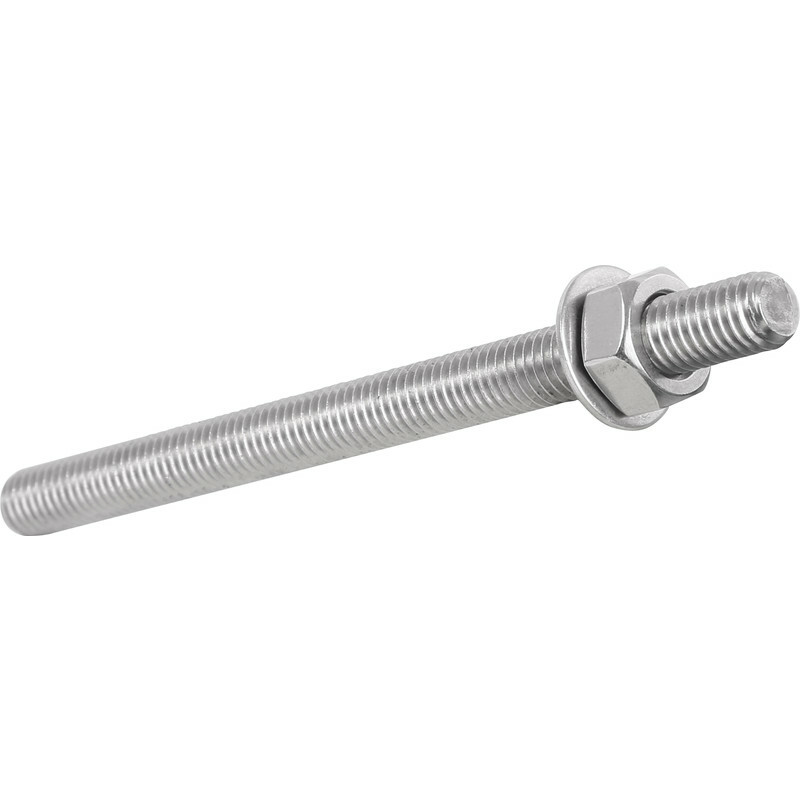 A2 Stainless Chemical Stud M10 x 130mm (10 Pack) is rated 3.0 out of 5 by 5. Rated 3 out of 5 by Teacake from Not as shown in the photos I've used these a number of times and in the past have been supplied with the type shown in the photo with a break in the thread and a hex end on them. As others have said Toolstation now supply lengths of plain threaded rod. Although they do the job, they are not as easy to use and it is misleading of Toolstation to show one type of stud but supply something else. First time Toolstation have disappointed. Rated 1 out of 5 by Electrocoolman from NOT AS PICTURED OR DESCRIBED The items supplied were just plain lengths of threaded rod with nuts & washers. There is no “wedge end” and no means of rotating the stud whilst driving it into the resin capsule (as required and as is suggested by the picture) making it totally unsuitable for use with resin capsules. Plain studding as supplied would work with resin gunned from a cartridge, but not capsules. The Toolstation purchase department needs to examine the specifications for these studs. Wasted time, effort and money over these, as I had to return them and reorder the much more expensive Fischer ones. Rated 1 out of 5 by Stu1969 from Product does not match image These arrived without the Allen key head as shown in the image. They are simply threaded bar. Rated 5 out of 5 by DiscoSK8 from Does the job Had to anchor a fence post to a wall, wanted to make the job a easy as possible give the limited access. Did the job brilliantly. Now looking for other applications for the spare studs and resin.